Hugo Chavez was once Venezuela's media darling. The love affair has taken increasingly bad turns. Now, he is the media. Rodrigo L. Arcaya is a 36-year-old Venezuelan who owns a web development company in Caracas. He is an iconoclastic, anti-authoritarian opponent of excess state power. As the world now knows, Chavez shut down Venezuela’s respected 53-year-old TV station RCTV, accusing it of "subversive activities." Out in the streets of Caracas, and in many other cities, people have been taking to the street — particularly the high school and college students. This has caused incredible traffic jams here in Caracas, as the most common form of protest is to close the streets, leaving only one lane for the cars. Many of the drivers that have been trapped in these traffic jams show their support for the dissenters by keeping their emergency lights on, shouting slogans against the government and even stopping their own cars on the only open lane. But why are people here so upset? Because Chavez is clearly making a play to control the national TV media as a mouthpiece for his government. He is doing this using a little-known law that resembles the U.S.'s Emergency Broadcast System. Some background on the relationship between Chavez and the Venezuelan TV media is needed. In Venezuela, we have four TV channels that have national coverage, and about twelve local ones. Of the four national channels, we have RCTV (whose license was just revoked), Venevision and Televen, which are privately owned, and VTV, which is owned by the government. At the local level, the most important is Globovision (which Chavez is threatening), a 24 hour news channel. It has coverage in all major cities (it's pretty spotty in rural areas). It's also worth mentioning the Asamblea Nacional channel (think C-Span, owned by the government), and TeleSur, a 24 hour news channel that is co-owned by the governments of Venezuela, Brazil, Argentina and other Latin American countries. We don’t really have many local cable channels. Most cable channels are Spanish language versions of U.S. networks (FOX — the entertainment channel, and MTV. We also get the U.S. versions of Fox News and CNN in English) or channels oriented toward Latin America as a whole. Venezuela has an odd little law that most international analysts don’t comment on. But the law plays an important role in this narrative. It allows the president to order all TV (including local stations going through cable) and radio station to transmit the same signal that is being transmitted through the government channel. The idea is that the president can have a way to talk to all the country in an emergency. In theory, it is not much different from the U.S. Emergency Broadcast System, but it's centralized through the presidency. We call it a “chain” — as all the signals are chained to one. However, the idea is not the same as the application, as we will see in a moment. With those words, people fell in love with him. Not only had he assumed responsibility for his failure (an uncommon trait among political leaders everywhere), but even in his defeat, he had the courage to see a future where he would be victorious. And if the people fell for him, the private TV channels positively swooned. The private TV networks were instrumental in getting the idea out that Chavez and his people were not actually traitors to their oath to protect Venezuela. In fact, they were young idealists who — by following that oath to its last consequence — had to rid Venezuela of its corrupt ruling government. In that climate, Chavez and his co-conspirators were pardoned by then President Caldera. The love affair was not surprising. Since the end of the ’80, most of the private media had turned really critical of the government. Fueled by this media frenzy, Chavez created his party MVR, and against all prognostics, managed to win the ’99 election. For the first two years, the relationship between private media and Chavez can only be described as a honeymoon. The happy marriage started to fray when, after having a new constitution approved, Chavez started to demand “legislative powers.” The idea was that the presidency could draft up new laws and get them approved, bypassing congress. Private media was critical of the move, but Chavez had a convenient way to retaliate. Every time he wanted to tell his side of the story, he just ordered a “chain” and started talking through all the TV and radio channels. Things quickly became quite surreal. One time, I was driving to work and turned on the radio. The only thing I could hear was a “thump-thump-thump” noise. I flipped to the next station, and the next one, and the next one. "Thump-thump-thump." Was my radio broken? Had aliens attacked, jamming all the radio waves? I got to my office, turned on the TV, and found that the president had decided to “chain” a live broadcast about the inauguration of the construction of a tunnel where Chavez worked on a hydraulic hammer for about half an hour. "Thump-thump-thump." This brings to mind the strangeness of the April 11, 2002 "coup." I’m not even going to try to explain that Gordian knot of surrealism in this dispatch — but let me introduce a few basic facts. The crowd on April 11 got a little out of hand. In fact, it was a bit of a riot, but the demonstrators were essentially unarmed. (Venezuela is a bit like Texas, so we have to assume that some folks may have had guns). Just as the march was approaching Miraflores, Chavez “chained” the broadcast, and started giving a speech. He told the people that the situation, which people had been watching on their TVs, had been calmed. He appealed to the few "misguided people" that were coming to Miraflores to think twice. At the same time, open warfare had come to the streets of Caracas. People on both sides were dying. A group of Chavez supporters that were “guarding” Miraflores opened fire on the march. The police and some people on the march started firing back. Or, maybe the government narrative was correct and the marchers started shooting the government supporters first. Either way, el Presidente was on live TV saying everything was under control while, less than 6 blocks away, people were firing guns at other people. At this point, all the TV stations came to a decision: They would respect the spirit of the law, and keep the president’s feed, including the audio. But they split the screen, so that people could see what was actually going on at the same time. This is the main reason the government now says that RCTV was behind the coup. You see, if those images hadn’t been broadcast, people would not have started rioting all over the country. Of course, RCTV, Venevision, Televen and Globovision all did this. So why did Chavez single out RCTV? This one is a no brainer: over the last two years, there has been talk about the end of the concession to RCTV, Televen and Venevision. And in these last two years, both Televen and Venevision have been letting go of their hard-hitting journalists. They have stopped reporting things that the government doesn't like. This self-censorship hasn't been at all covert. Everybody here knows. It is telling that the ratings of Televen and Venevision have dropped, while RCTV’s ratings climbed to over 40%. It is also telling that cable subscriptions have jumped to 60% in urban areas and is rapidly increasing. The concessions for Televen and Venevision have been renewed for five years. And, as everyone now knows, RCTV – Venezuaela's first network — stopped broadcasting this Sunday, May 27. Many naïve, foreign “Chavistas” seem to believe that the government “only” stopped a concession, and that they did not interfere with a private, independent media company. That is false. This is particularly illustrated by what followed. On Thursday, May 24, a group of “concerned citizens” entered a plea with the Supreme Court. They claimed that shutting down the RCTV signal was unconstitutional, because RCTV was the channel with the greatest coverage in the country. The litigants claimed that if their signal was to disappear, a lot of people were going to be left without TV. The intention of this suit was devious. On Friday (less than 24 hours later — it usually takes a year to get a case before the court) the Supreme Court ruled that, in defense of the citizen’s rights, RCTV had to give, without payment of any kind, all their broadcast equipment to the new government channel that was to operate in their old frequency. So the government has a brand new channel. This is not about a concession. This is about a Government taking control of a private media company. They claim they're doing this to “increase the free speech in the country.” Here's the logic: before Sunday, we had two strongly critical networks (RCTV and Globovision, which is local), two uncritical but indifferent networks (Televen and Venevision), and one strong Chavez supporter (VTV). With RCTV out of the picture, the number of strong opposition messages are reduced. According to government spokespeople, these voices are somehow replaced by something they call community messages: “Messages produced by The People, for The People”, as they say. Thus, of course, there will be more free speech. (I’m not making this stuff up. These are actual arguments used by government spokespeople.). Of course, when you realize that one of the principal party slogans of the government is “Chavez is The People,” this message turns even more sinister. As of today, there are still people who refuse to give up. They are willing to keep the protest going for as long as it takes to bring RCTV back. Meanwhile, a YouTube channel, created by the news crew of RCTV, continues to post news content, including footage of protests that no other TV channel here is showing. It has had more than 71,000 views in just two days — an enormous number when you consider that Internet penetration here is below 15%. As of this writing, it is number two on YouTube's "Channels" listing for new subscribers. It looks like things will get worse. The President is talking about shutting down Globovision for — and I swear that I'm not making this up — "subliminal association." His evidence: during a talk show with the head of RCTV last Friday, every time that they cut to commercials they showed a little clip of the most important news events that have been covered by their news department: the first landing on the moon, the return of democracy to Venezuela in 1958, and so on. During one of these segments they showed the Pope's assassination attempt, while playing Ruben Blades song that says, “Everything comes to an end” as music background. The regime claims that they were subliminally inciting people to kill President Chavez. Yesterday the General Attorney announced that both the General Director of Globovision, and the anchor of the talk show have been summoned to be “interviewed” regarding this “plot”. Hugo Chavez is a world-class authoritarian. Those of us who are anti-authoritarian and who have seen it up close, tend to know more than those beyond our borders, about what he has done and how he has done it in his almost 8 years of government. It seems that there is a sort of racism underlying some of the sympathies and excuses made by American and European dissidents (who should know better) for the Chavez regime. They imagine that Latin American people are backwards and need an authoritarian government. In fact, most educated Latin Americans are quite accustomed to free speech and basic human rights. We don't really need the paternalism… but thanks anyway. Of course, this regime is no ordinary Autocracy. If it were, probably most of the people in Venezuela (and in the rest of the world) would have wised up and recognized it as one. What we are living now down here can only be described as a Surreal Autocracy. Frankly, I've kind of enjoyed this government. Its comedic moves have provided daily amusements. If I wasn’t aware of the really terrible consequences of continuing down this road, I’d be trying to prop up this regime and find it an agent in the entertainment industry. If people outside the country really knew what is going on here, they could make an astounding reality show and sell it on pay-per-view. We have members of the Congress who claim they have discovered that the DirectTV set-top boxes have bi-directional communication capabilities and that they had cameras and microphones that transmit, by satellite, to the central headquarters of the CIA. (Actually, I guess some American conspiracy freaks wouldn't find this claim the least bit nutty.) Then there was the very serious announcement from Chavez about how the government managed to stop a plot to kill the president. You see, they found this bazooka in an empty lot that lies kind of near the flight path of Venezuela's biggest commercial airport. And — ohmygod! — it's the very same airport that the presidential plane uses. They also found a picture of Chavez. Aha! This was a plan to hit the presidential plane — the picture of the president was for “obvious identification purposes." No one was ever arrested for this clever and devious plot. These sorts of things happen here at least on a weekly basis. Indeed, I've developed a morbid obsession with the entertainment value of this government. But now, I think it's time for a new show. Detention and Torture: Are We Free Or Not? What’s this? Competition to out-voice the Village Voice for banal “hip” liberalism? You might as well look for jobs at the New Republic where they pay good money for counter-revolutionary pap. Pingback: miniPLUG » El canal de You Tube de El Observador bate records. People, there’s no conspiracy theory here. Chavez isn’t being coy about controlling everything anymore, he shouts it at us every day. Look for any recent speech on You Tube or whatever and you’ll see. It’s easy to admire him from the distance, but if you lived here you’ll see everything is a joke, everything is in ruins and nothing works. And that’s just the beginning of it. Thanks, Rodrigo. This was actually one of the best pieces I’ve read on the subject. History will judge this regime, as it has judged Peron, Vargas, and others. Sadly, you & I probably know our Latin American history better than most other “outside” observers. One of the sadest things, of course, is the way that most of the pro-Chavez comments on blogs seem to come from English (or at least European) surnames; so I’ve also noted the kind of weir racism. At another blog, an American actually said my “mental defectivness” (because I didn’t like his position) was “because of my genes” (swear to god) and that I was only where I was “because of affirmative action.” I guess that’s what passes for progressive these days. Sometimes I wonder if the reason so many turn away from the left in dissilusionment, is because of how fellow leftists treat each other. Hi Hal – Just wanted to point out that I’m perfectly aware of the bad politics of the US towards Latin America – I live everyday the consequences of more than 50 years of Imperial politics. However, “the enemy of my enemy is my friend” is true only on the realm of formal logic. I can be anti-Chavez and anti-Imperialist at the same time. As a matter of fact, most people catalog me as a “leftist”. But I’m also strongly anti-autoritarian. I want people to realize that this is not a problem of Left vs. Right. This is not even about Rich vs. Poor (Which is a BIG problem down here). This is about a small elite, lead by one person alone, who wants to tell people what they can or cannot do. This is about a person who has said: “If someone doesn’t like my government, they are free to leave the country”. Think about it. Great piece. I’d love to republish this on my site, GNN.tv? Let me know if that’s possible. Anthony, that can be arranged, but you’ll have to give me some way to contact you. You forgot to mention in your breakdown of cable channels that RCTV is broadcast (and still broadcasts) on cable (also on Radio). Also that ‘shutting down’ is not the same as not renewing a license because of failure to abide by agreements (like not supporting a coup, like RCTV did). Seems you forgot a few things in your summary. In fact, most educated Latin Americans are quite accustomed to free speech and basic human rights. We don’t really need the paternalism… but thanks anyway. Yes, educated Latin Americans, who make up a much smaller share of the population. I hardly need to comment on how many of those people view their poorer masses of their fellow citizens, or how they recommend their governments treat those individuals, since you are already familiar with such things. Rodrigo: Great article. I share that same amusing/disturbing feeling both during Chavez unending chains and during congressmen debates. My favorite is when Chavez talks about physics or when they intercept America’s government confidential faxes. Yes, faxes. – R.U. Couldn’t agree more… wings are dumb! I also agree with Rodrigo: it’s not a left/right problem. I even think the left/right categories are somewhat old, and they’re not very efficient to rationalize reality anymore… The left used to be linked to certain values that many current left-wingers are not for. On the other hand, Chavez may say he hates the oligarchs and the rich, but he still wears Armani and Rolex while he asks people “to defend the revolution even if they have to starve and be naked to do so.” He’s been accusing people of participating on the coup even before the coup on 2002. And he’s been accusing, for instance, anyone who demonstrates against him (and that includes me, for I have demonstrated, unarmed, and swallowed the army’s tear gas many times, but most certainly did not participate on any coup). And if you think FoxNews is somewhat pro-government, you should watch VTV and TEVES, which together don’t get 12 points of share… I wonder where is the majority of Chavistas in the country and what are they watching. It’s not that I watched RCTV all my life and have many beautiful memories, as some Venezuelans have said. I actually don’t like what they air, (I don’t like Venevision or VTV either). But I think they’re just cutting our civil rights. And if other people want to watch it, they should be entitled to it. And if the excuse is the launching of TVES (now on RCTV’s signal and equipment) they could have done it on a different signal… oh, I keep forgetting, they would have to pay for the equipment to broadcast nation-wide. Yes, Chavez won the elections. But did you know that the person in charge of the Electoral Council, an allegedly autonomous branch of the government, who was supposed to guard the election process, to make sure it was clean, is now the solemn Vice-president of the Republic? And one of the most important members of the new Chavista party, too. HI it is really amazing how pepople outside this country really think that have any clue of what is really going on here, this country has 7 times the budget that it had 10 years ago and the country is even worse then before, the politicians with chavez have 30 million dollar bank accounts and HUMMERS, the vice president that had no money when chavez became elected has a House on Lago di Como in Italy that its worth 10′ million dollars and they dont even try to hide it. This is the most corrupted government ever in Venezuela and we all know it, it does not have one bit of comunist in them, they do not help the people it is all a big lie and part of a personal vengeance that chavez has against the rich people that by the way they all went away, but it is a lie he calls “oligarcas” to any person that has ever owned anything, he destroys the middle class the working class, he is just another dictator that is all. They are to busy creating a new elitist group of politicians with huge bank accounts to be helping anybody……. all the governments have always done the same thing in this country. This is the biggest scam of all times this man has turned the countrys budget into his own personal bank account… You have no idea really, i dont see any americans leaving their country because for better or worse the sistem seems to work and still all you do is complain. Interesting article Rodrigo, it’s obviously interesting to hear the journalism of a native of Venezuela, but I can’t help thinking that your being a bit too harsh on Chavez, painting him as some kind of broadcasting dictator. It’s always important I think to get the background history of the politics of countries to get a better perspective on the situation. Have you lot ever come across a radio show which is broadcasted from Georgia called “OutThere Radio”? They did a great analysis on coup’s in South America. The segment was called “Anatomy of a Coup”. Here’s a summary of the podcast and a link, enjoy! Learn how to engineer a military overthrow of a South American government in this week’s episode! We look at American involvement in the destabilization and eventual overthrow of the Chilean government in the 70’s in light of the attempted coup in Venezuela in 2002. I think i’ll go with what Pmayne thinks about getting the background history of politics before trying to judge…I also think Chavez is also trying to do what’s best for his country, after all why is the media, and other political leaders on his case. Great spirits suffer opposition from mediocre minds and it’s always been like that..they either remove you from power, or have you killed…but if you ask me, every dog gets his day..powerful freemasons or not. They are all devil worshippers anyway, except Chavez i’m on his side..May Gog bless him. You mean RCTV can no longer use a public resource (the airwaves) to support the overthrow of a democratically elected government? Damn, that’s harsh. The US and other free nations would surely renew a broadcast license if a television behaved similarly in their country. Nope, there is no need to listen to the foreign Chavistas when the majority of the Venezuelan population has already spoken. BTW I love “coup” in parenthesis. It really helps to demonstrate your credentials of one that is concerned with democracy when you trivialize a military coup that ultimately failed because the majority of the Venezuelan population was so opposed to it. Hi Stuart, thanks for your comments. I probably should have explained a little bit why I wrote “coup”, but for space considerations I decided not to make the article more complex that it was. Personally, I do believe that a coup happened –as a matter of fact I think that TWO coups happened in just a matter of days. 1)On the morning of April 11, quite a large number of people decided that they were tired that the government spokespeople continue to say that they were “special effects” and that they were going to Miraflores (think the White House) to prove that they were real. (the government line was that the concentrations of people were actually very few people, and, that the TV stations where using 3d software to make the concentrations bigger). Or, you can parse it using the official interpretation that quite a lot of people were manipulated by a few voices and decided to march to Miraflores to kill Chavez. Really, the interpretation of their motive is irrelevant in this analysis. 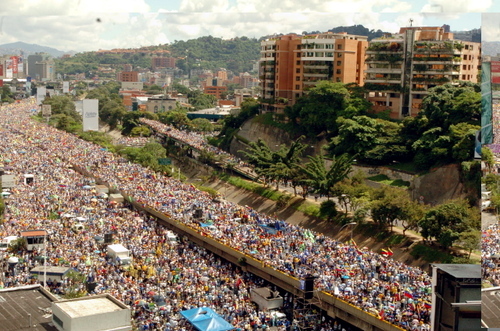 2)As the people were approaching Miraflores, Chavez ordered a “chain” and started telling people in the country that the manifestation had been dissolved and that everything was under control. At the same time, people were shooting each other very, very close to where Chavez was broadcasting. The commercial TV stations (all of them, not only RCTV) decided to split the screen to show what was really happening. 3)About the same time, orders where given to the high command of the National Guard and the army to mobilize troops to Caracas to contain the manifestation. Citing humanitarian concerns, many generals refused to try to contain an angry mob using military personal. 4)Some national guard units did comply with some of the orders. For example, a unit was dispatched to the central broadcasting antenna for the tv stations in Caracas, and, at gunpoint, ordered that the commercial tv stations signal must be stopped. A media blackout happened, leaving everybody wondering what the hell was going on. 5)Around midnight, the TV signals where back online and the Gen. Lucas Rincon (the highest ranking officer in the country and a close personal friend of Chavez) announced the country that Chavez had handed a resignation, and that his only request was to be allowed safe passage to Cuba. He went on saying that Chavez was not coerced in any way to present the resignation. 6)On the morning of the 12, and all through the day, not only many of the government officials were recognising the fact that their government was over, but even the Cuban ambassador were recognising Carmona’s presidency. At the same time, many, many voices in the opposition where really critical of the choice of Carmona as an interim president, but also saying that new elections where necessary immediately, otherwise the new government will be illegal. It is telling that quite a lot of the prominent figures on the opposition were absent at the confirmation of Carmona as an interim president. 7)On the 13, there were quite a lot of protest – Many because they wanted Chavez back, but also many criticizing the choice of Carmona as a president. In Caracas, the only place I can give you a personal report, the protest were a lot smaller than the protest on April 11 – Only they were quite a lot more violent. 8)The negotiations between Carmona’s group and the military leaders fell down; both had quite different agendas on what to do with the country. Also, Carmona’s people where against the idea of letting Chavez go to Cuba, as they wanted to try him for the deaths of April 11. The idea that it was “the people” who put Chavez back in power is a romantic, but mostly false, account of what happened those days. 9)The same military people that did the coup against Chavez did a re-coup and put Chavez back in power. Case in point, the general that announced that Chavez had resigned continued to work closely with Chavez, and now is the Ambassador of Venezuela in Portugal. 10)In the aftermath, the governments proceeded to block all attempts for an independent review of what happened on those days. The only people that were charged where from the opposition group, and even for them, the Supreme Court had to rule out that, if Gen. Lucas Rincon was telling the truth, there was no coup, only a resignation – And if he was lying, well, he is the one who should be charged with the coup accusation or at least be part of the same charge against these people – That’s were the doctrine of “vacuum of power” started. Fact is that no one has ever been found guilty by the Venezuelan legal system for that coup. No one related to RCTV has even been CHARGED with any crime related to coup. So, the argument that they incited a coup is only hearsay. I heard many people make the analogy “What if ABC decided to make a coup against Bush and he decided to close ABC? Is not his right?” But that argument is flawed… The real question you must be asking should be “What if Bush started saying that ABC was helping a coup, and then, without any confirmation of that affirmation from a court of law, and without presenting any credible proof (in the legal sense), he decided to close ABC?” Would you support that? Because, frankly, that is what you are supporting when you support the closure of RCTV. So the people in Venezuela will miss out on cheesy soap operas. Who cares if Chavez shut down RCTV? Mr. Liebertz you got your facts wrong. It´s true tha Rctv splited their screen, like all the others channels did, but it was a journalist from another tv channel (venevision) and not from rctv who “cut images of Chavistas shooting off of a bridge and claimed that they were targeting a sea of unarmed peaceful protestors below” and even if this is true no one has shown a bealivable proof of this. long live Chavez! down with baby Bush and papa Bush!